My son Jaxon was just four years old in 2017 when he was diagnosed with medium to high risk acute lymphoblastic leukemia. It was a shock to me. What I initially assumed to be growing pains was actually deteriorating bone marrow density and a spinal compression fracture. Whoever heard of a preschooler with a broken back? I had no idea what lay ahead. I was terrified. 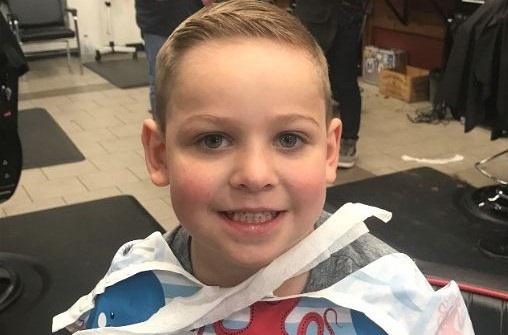 The turning point for Jaxon happened within the first month of treatment, which they call remission induction, where they attempt to destroy all the leukemia cells in the patient’s blood and bone marrow. During this time, Jaxon rapidly put on weight due to the steroids. Not only did his skin itch and his body ache, but he was also dragging around all this extra weight. He was on painkillers that didn’t minimize the pain, but made him feel lethargic. This was quite a change from the active boy we knew. As his mother, this was the hardest thing for me to see, such a drastic change in behaviour. I still struggle with this. Sometimes I worry that I will never get that boy back. I continue to learn more about the immediate and long-term effects of treatment, as we move through the journey of battling cancer. I’ve learned that chemo injections into the spine causes personality and behavioural changes. It also causes learning difficulties. 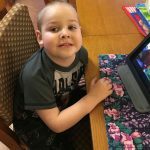 I tried to prepare myself and my other two children for Jaxon’s eventual weight loss, loss of hair, nausea and mood swings, but I’m not sure anything could have prepared us for the personality changes we saw. How do you mourn the loss of the personality and life we knew as Jaxon? This disease greatly alters and rearranges the lives of a family. Cancer effects our whole family. Although we all rallied around Jaxon and the well-being of my other sons Ethan and Ryan, my marriage dissolved quickly under the pressure of our new reality. 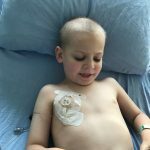 I think Jaxon’s father just wasn’t prepared to see the effects that cancer had on his child. 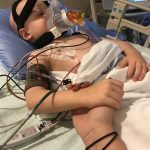 He still has zero interest in dealing with Jaxon’s cancer and the treatments. He even refuses to take the other boys, while Jaxon and I are at the hospital. L-R Jaxon and his brothers Ethan and Ryan. 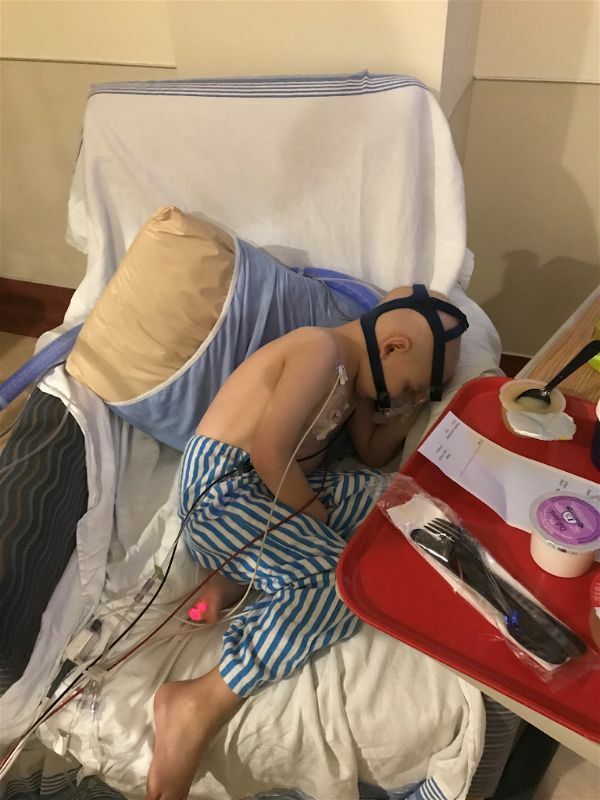 Jaxon’s brothers have rallied behind him and are helping him through this painful time in their lives. My children have shown amazing strength and resilience throughout all of this. Jaxon’s brothers have bonded together to help get us through this in really incredible ways. Jaxon’s twin brother Ryan has become Jaxon’s voice and confidant, while his older brother Ethan takes on a more protective role. When Jaxon’s hair started falling out, Ethan was always there to tell him he looked cool or to stop others from drawing attention to it. As a single mother, I continue to be inspired by how my sons have dealt with the changes Jaxon is going through. They have all played an important role. Jaxon takes a moment to chill at the hospital. 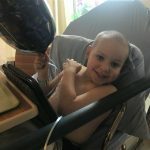 Jaxon is still actively fighting this battle and will continue to do so until July 2020. 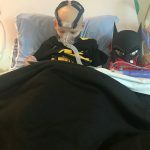 At that time, he will be seven years old and will have battled cancer for most of his life to date. Battling leukemia is long and arduous and even when the treatments are over the battle is not. 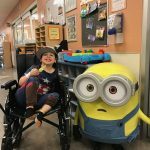 The treatments can cause depression in kids, which is something Jaxon battles with regularly, saying things like, “Just let me die” and “Aren’t I better yet?” Not surprisingly, he usually says things like this after an extended hospital stay. 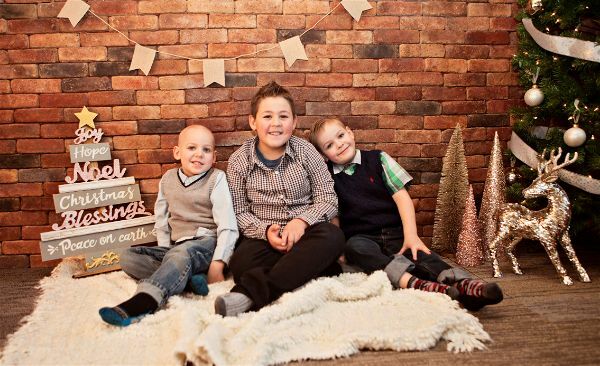 It’s difficult for Jaxon’s brothers to truly understand just how long treatment is. For most kids, an illness is usually over within a week or two. Being on treatment for three and half years is difficult for children to comprehend. 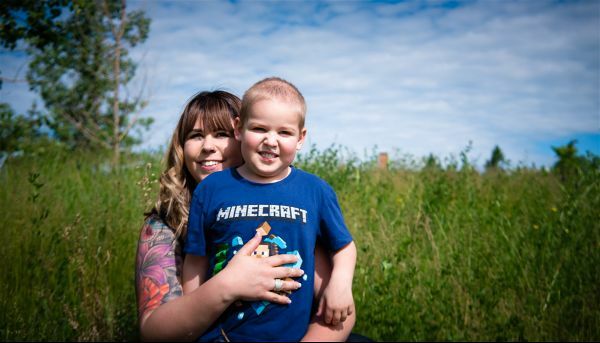 “Aren’t I better yet?” Jaxon asks, a year into his three-and-a-half- year treatment. At this point in Jaxon’s cancer journey, my boys are just grateful for his improved health. We are now more focused on paying what we can forward. We are grateful for the amazing people and organizations who have helped us get through the first very tumultuous year. I don’t think we would have done as well without the support of Kids Cancer Care. I don’t know how I would give the kids the foundation for emotional healing that Kids Cancer Care provides. For me, the best decision I made, as a single unemployed parent of three boys, was to focus on my son’s recovery and make sure he was not alone. The support Kids Cancer Care provides our family allowed me to do that. They have been there for me and Jaxon and his brothers through every step of this journey. I know the foundation is there for people just like me, facing the same family crisis that we have faced together. They know the struggles. They know next steps. They have the empathy and the experience of interacting with parents in shock and then throughout recovery. That allowed me to breath, during a time when I felt I was drowning. I am grateful for my children every day, but as we draw closer to Christmas, I feel even more blessed. I cherish the love of my children and all the love we have in our lives. May you be blessed with health, love, peace and joy this holiday season and everyday of the year. 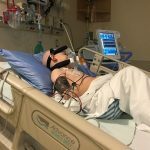 The day Jaxon was diagnosed. 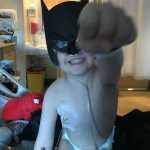 This kid is a superhero. Jaxon replaces his Batman mask for another mask that is a lot less fun. 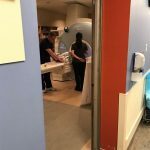 Jaxon goes in for an MRI.